Kedgeree. Y’all know what this is, right? Rice, with boiled eggs and smoked haddock. Traditional Friday/Easter/breakfast fare. Especially appropriate on Good Friday. You may also know that it originated in colonial India. But what a lot of people don’t know is that authentic kitcheree (or ketcheree in Afghanistan) is just rice and mung beans (or sometimes lentils). No fish. No egg. A soft and comforting mix of spiced rice, peas and (sometimes) yoghurt or whey (aka Iranian Sauce – see the picture to the right). It is part of a ‘family’ of rice and pulse dishes which extends across the Middle East (and perhaps includes koshari, the popular Egyptian street food). 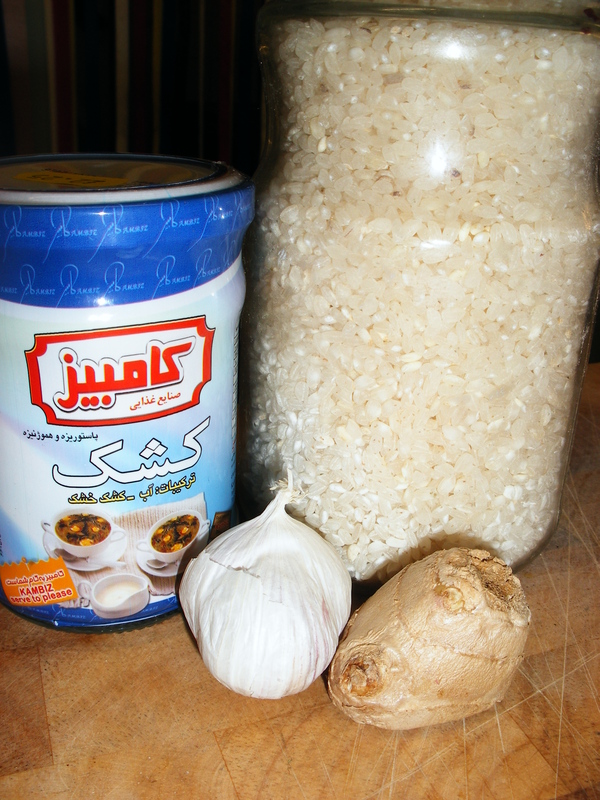 The recipe below owes a bit to the lovely Helen Saberi’s recipe in Noshe Djan, and a bit to the fact that Mrs. Shopkeeper just loves messing around with rice and beans. Put the mung beans in a pan of water and bring it to the boil; simmer for 10 minutes and then add the rice together with enough extra water to cover them with 4cm to spare. Simmer for a further 30 minutes or until the beans and the rice are soft and the water is all absorbed. Cover the lid of the pan with a clean tea towel and leave to sit on the stove while you make the rest of the dish. Ketcheree is a soft, mushy affair, and so do not worry about ‘overcooking’ everything. Next melt the butter in a pan and fry off the onions until they are soft; add the ginger, garlic and chilli, stirring for a minute or two, followed by the spices. Take the pan off the heat and stir the contents through the rice and beans, season to taste, and then finish with the chopped coriander. Mix the kashk or yoghurt with the mint: if you are using bottled kashk you may need to mix it with a little water to thin it down. Pile the ketcheree on to a plate, make a well in the middle and pour in the seasoned yoghurt or whey. This is a great dish on its own, although in Afghanistan it is more often served with kufteh (meatballs) or a rich, tomatoey qorma. I just found a bottle of this Iranian Sauce in the fridge that I bought from Persepolis ages ago, and decided to have it on buttered toast with a bowl of soup. It was very good and even though a little goes a long way, it was quite moreish. I’ll bear in mind watering it dow, that makes sense but definitely, it has a good kick.